Smart TV: What is 'Smart TV'? Screen Resolution: What is 'Screen Resolution'? Why choose an Outdoor TV? 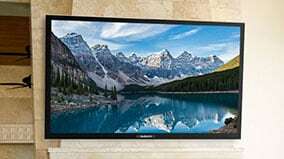 Designed to withstand extreme temperatures and other outdoor elements, these crystal-clear HDTVs allow you to watch your favorite sporting events, movies and television programs while enjoying the outdoors. Turn your deck or patio into the ultimate entertainment center with an all-weather Outdoor TV! What Makes an Outdoor TV Different? We offer premium Outdoor TV models that have been engineered and weather-protected to be used outdoors. Outdoor TVs are asked to endure an environment much harsher than an indoor TV which is why outdoor TVs usually have a higher price tag. Even the remote controls are all-weather! There’s no compromising on the durability, strength, and luxury of an outdoor-rated television. The displays on outdoor TVs reduce glare with LED panels, resulting in a crisper picture under natural outdoor lighting conditions. For best results, mount your outdoor TV under shade and face your outdoor TV north to further reduce glare from the sun throughout the day. Outdoor TVs have been built with weather-resistant materials and technologies to help them endure the extremes. An outdoor-approved TV will handle the increased humidity, salty air, very high or low temperatures, and occasional splashes with no trouble. We recommend having an outdoor tv cover on hand to provide extra protection when your TV is not in use. As with their indoor counterparts, Smart Outdoor TVs have built-in internet connectivity, allowing them to access a wide array of services like Netflix, Hulu, or WatchESPN. Many Smart Outdoor TVs also allow operation via a smartphone app.